Kindly funded by Pound Arts and ‘Focus in on life’ charity. Project outline: The Pippin Project is a practical music and arts-based educational project taking place in four rural communities in Wiltshire and South Gloucestershire which will celebrate and raise awareness of the heritage of orchards and create a long term legacy through the planting of an orchard in each community. 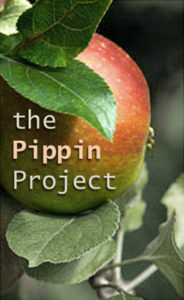 The Pippin Project will give young children an opportunity to engage directly with the environment and the countryside. They will do this through the research and creative planning they will undertake prior to planting their community orchard. Through this the participants will learn about the heritage and significance of Britain’s orchards and the wide variety of apple varieties in Britain and within their own county including those that have died out. Artist Scott Farlow and the participants will seek advice from experts such as Brogdale, home of the National Fruit Collection, Wiltshire Wildlife Trust and the People’s Trust for Endangered Species. Through the music workshops and performance, the participants will develop a greater understanding of the history of orchards and apples and how apples were first introduced to Britain. It will give them an opportunity to develop performance and composition skills and to experience live performance in their community. The plan to care for the orchards devised during Scott’s creative workshops will give the pupils, teachers and parents the knowledge and skills that are needed to ensure the project legacy thrives for the future. The children have worked with Scott and Karen for three days. During this time we have discovered other apple trees in the village, completed our colour palettes, finished our layered collage, written blessing, and written songs, learnt dance and formulated the Manifesto. As ingredients for the Apple show. Their landscape, home and the beautiful leaves. Creative spirits were shared and heard. And words expressed as incantation.